"In Germany on the morning of 21ist April,1945,Guardsman Charlton was co-driver in one tank of a troop which,with a platoon of infantry, seized the village of Wistedt. Shortly afterwards,the enemy attacked this position undercover of an artillery concentration and in great strength, comprising, as it later transpired,a battalion of the15 Panzer Grenadiers supported by six self-propelled guns. All the tanks, including Guardsman Charlton's, were hit; the infantry were hard pressed and in danger of being over-run. Whereupon, entirely on his own initiative, Guardsman Charlton decided to counterattack the enemy. Quickly recovering the Browning from his damaged tank,he advanced up the road in full view of the enemy, firing the Browning from his hip. Such was the boldness of his attack and the intensity of his fire that he halted the leading enemy company, inflicting heavy casualties on them. This effort at the same time brought much needed relief to our own infantry. For ten minutes Guardsman Charlton fired in this manner, until wounded in the left arm. Immediately, despite intense enemy fire, he mounted his machine gun on a nearby fence, which he used to support his wounded left arm. He stood firing thus for a further ten minutes until he was again hit in the left arm which fell away shattered and useless. 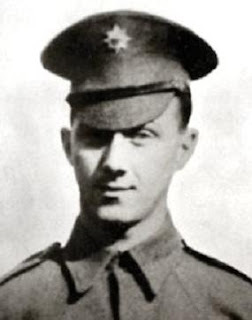 Although twice wounded and suffering from loss of blood, Guardsman Charlton again lifted his machine gun on to the fence, now having only one arm with which to fire and reload. Nevertheless, he still continued to inflict casualties on the enemy, until finally; he was hit for the third time and collapsed. He died later of his wounds in enemy hands. The heroism and determination of this Guardsman in his self-imposed task were beyond all praise. Even his German captors were amazed at his valour. Guardsman Charlton's courageous and self-sacrificing action not only inflicted extremely heavy casualties on the enemy and retrieved his comrades from a desperate situation, but also enabled the position to be speedily recaptured." 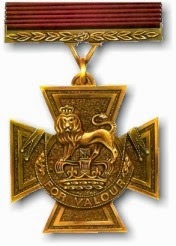 From Guardsman Charlton's Victoria Cross citation, awarded on May 2, 1946. Touching story. Very nice read, it's always moving hearing real stories of those that have been through wars. Thanks for this blog!